At Dermalogica, we put skin therapists first – which has led us to develop the most effective, and unique, treatment concepts in the industry. Let’s face it – as skin therapists ourselves, we know that your business is based on getting real skin results, every time! That’s why we developed the Dermalogica Skin Treatment, 100% customized to each individual’s skin health needs. It’s one results-driven treatment… that’s different every time! Learn this amazing treatment step-by-step in our exclusive Dermalogica Skin Treatment class. Hands-on instruction from a highly-trained Dermalogica educator pairs with helpful tools including the Dermalogica Consultation Card and Face Mapping® skin analysis to create a treatment that not only feels amazing, but delivers incredible results. More and more skin care professionals tell us every day that they use Dermalogica because it delivers results in the treatment room. And, those results extend beyond their treatment room trolley, as more skin careprofessionals use Dermalogica on their own skin to experience the same amazing results their clients rave about. Shape your unique brand image for a client experience that’s as unique as your business! Inspired by our educational roots, we’ve created interactive, hands-on experiences that hook new clients and deliver skin health results for clients that keep coming back for more. Every skin has a story – tell it with Face Mapping! 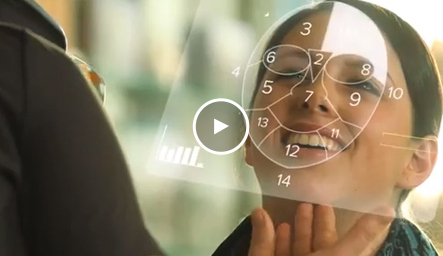 Developed by The International Dermal Institute for Dermalogica, Face Mapping® skin analysis is proven to boost retail sales by as much as 40%, and is one of the reasons why Dermalogica accounts are the most successful in the business! Combining your professional knowledge of the skin with sight and touch, Face Mapping divides your client’s skin into 14 unique zones, each with their own set of concerns. This one-on-one time provides a perfect opportunity to create a dialogue with your client, talking them through the professional Face Mapping process and asking them what their concerns are. From congestion to dryness to hyperpigmentation, Face Mapping allows you to explain in clear terms what you’re seeing on your clients skin, and why. By doing this, you’re positioning yourself as a skin care expert, and playing a vital role in helping them achieve healthy skin every day. As one of the most powerful retailing and client retention tools you can perform in your business, everyone on staff should be Face Mapping! Enroll in our amazing Face Mapping workshop to learn all about this ancient practice that means modern day results – and amazing revenue!